Office@Hand online account interface is designed for ease of navigation between Administrators and Users. The new interface may change from time to time but it still bares the same features and functionality. Easy access to common settings and functions based on individual roles in the company. 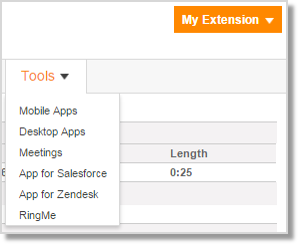 Reduce confusion with separate features and tools for Administrators and Users. Increase productivity with the new and intuitive interface. Administrators can add and manage Users under this tab. See User Info Overview to know how. Reports are graphical representations of your AT&T Office@Hand account’s call activities that can be generated by account administrators. See AT&T Office@Hand Reports Overview to know more about it. 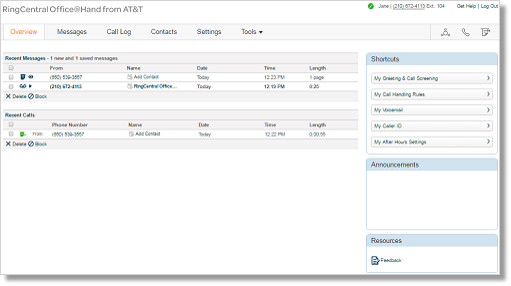 The Call Log provides customized reports on inbound and outbound calls, and faxes for AT&T Office@Hand Users. See Call Log Overview to more about it. 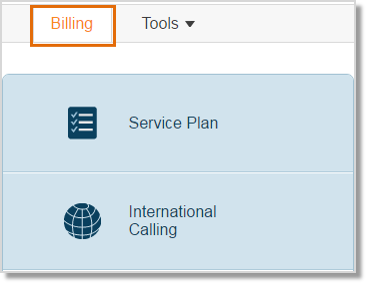 The Billing tab leads to menus for managing your Service Plan, and permissions for International Calling. See Office@Hand Billing Overview to more about it. Administrators can also configure other features under this tab. Available features may depend on the account subscription. Users can download different apps under this tab such as mobile, desktop and Meetings apps. 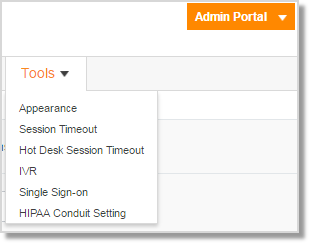 Administrators can also enjoy this functionality by clicking on the drop-down arrow and then select My Extension.